Doctor Who: THE ELEVENTH DOCTOR #2.15 Review @comicstitan | Warped Factor - Words in the Key of Geek. It’s end of the world as we know it. Tony feels fine. The thing about an Eleventh Doctor story-arc, either on TV or in Titan comic-books, is that by the time you get halfway in, you can barely remember any other way of the Eleventh Doctor being, any other story he could possibly be involved in. That means by the time you get to the final episode of an arc, the stakes are frequently so high that only something absurd and brain-wiping will really do the trick to break you out of the convoluted story you’re in, and normalise things to begin again next time. It also means that the thing that’s absurd and brain-wiping is rarely that effective as a moment of high tension, because the episode has to deal with so many other tangled character or event-threads too. The Big Bang in…erm…The Big Bang is almost incidental to the running-around, the proving of Rory, the forgetting and remembering of the Doctor. Similarly, the actual solution to the Impossible Astronaut conundrum in The Wedding of River Song is one of about five or six available solutions by the time it arrives, and to be honest, no-one really cares that much, because the episode is filled with the reckoning of the Doctor and River, some absurdist visuals and a healthy handful of cameos. The finale of the Eleventh Doctor’s first year at Titan had a sense of wash-up, people departing to their own futures without the Doctor, more than it had knuckle-biting tension and the potential end of the universe. It's worth saying up front that the resolution to Year 2 is better than any of those. It deals with a lot of the dangling threads from across the arc, explains why the Doctor went full douchebag in the middle, and gives this year’s involvement of comic joyfest Abslom Daak a full and appropriate ending, but it does all of that while foregrounding the imminent threats of the Volatix Cabal, the Malignant, and The Then and The Now, and giving us one more picture perfect peek into the events of the Time War. In fairness, it’s also worth saying that the actual solution here has more than a touch of on-screen Eleventh Doctor, a touch of ‘Oh I knew this was going to happen, don’t worry, I’m the cleverest life-form in the room, didn’t I say?’ which, after much of the emotional, companion-based trauma of the last few issues feels a little light and fluffy, but as we head to the end of this second year, the gang’s all here – Daak, River Song, Alice Obiefune, the mysterious Squire – facing a stand-off with evil gods and destiny. Given that the issue opens with Abslom Daak having been apparently fatally shot, that’s something of a miracle in itself. Perhaps the bigger miracle in the script of this final issue in the arc by Si Spurrier and Rob Williams though is that everyone gets at least something entirely significant to do, always a tricky manoeuvre when you’re dealing with a full Tardis. The Doctor’s actually the one who feels a bit Matty No-Mates in this issue, standing in the middle of chaos and impending universal conquest by evil gods and doing some shouting, directing a bit of the action here and there. Nevertheless, his dialogue, particularly with Daak, is classically Matt Smith, and the authenticity of his voice is preserved and presented hugely well here. River, having woken from a reasonably long, half-an-arc cryo-nap, is typically River too, her part in the solution typically infuriating for the floppy-haired one, typically ‘Oh look, here’s a fiddlybobbulous oojamaflip, yes, I’m actually more wonderful than you, isn’t that annoying?’ If you love a bit of River, you’ll love her here, perhaps more than at any point previously in this story-arc. Alice, bless her, the companion custom-built for comic-book Eleventh Doctoring, is the most practical of the gang, and the solution to the impending destruction of both the Cyclors, the Overcaste and then, probably in quite short order, the rest of the universe, is neatly piecemeal, involving River shooting something, Daak running the living crap over something, and Alice talking very nicely to something to get it to do what she wants. It also involves, as Alice is entirely right to point out, the Doctor proving he’s not a devious, manipulative individual by being incredibly devious and manipulative. And what’s more, you’ve probably never read a Doctor Who story where the fate of the entire universe depends on somebody reading or not reading a Post-It note. You will have by the time you get to the end of issue #2.15. What Spurrier and Williams give us though at the end of all that is a lovely triumphant air-punching climax, a kind of ‘everybody lives!’ moment that seems so unlikely, given the level of the threat, that the smile it gives you feels like an almost guilty Easter egg of pleasure. Everybody doesn’t exactly live. There’s at least one casualty among the Tardis crew, and if you’ve been following the storyline (and may the gods have mercy on your soul if you have), it’s the person you think it is, the one who pretty much has to not survive this issue, so that everyone else can. But given the phenomenal, ridiculous, fan-thrilling twists and turns this storyline has involved, a more or less happy ending was something we hadn’t particularly banked on. There’s another treat in this issue too. It’s Daak. Proper, unpasteurised, roaring, psychotic Daak, going properly kill-crazy in both a good-ish cause and pursuit of his obsession. We’ve been waiting fifteen issues for this Daak to show up, but of course in a post-Time War universe, where there more or less aren’t any Daleks left, he’s been forced into a different way of interacting with the cosmos. So to see a touch of unreconstructed Daak before the story ends does the soul of every Who-fan good, and feels like a fitting tribute to Steve Dillon. Spurrier and Williams also finally answer the question of what a Dalek-Killer’s supposed to do in a Dalek-free universe. You’re going to like it. You’re going to like it a lot. Artistically, Simon Fraser and colourist Gary Caldwell have been working in fantastic harmony for quuuuite a lot of this year. 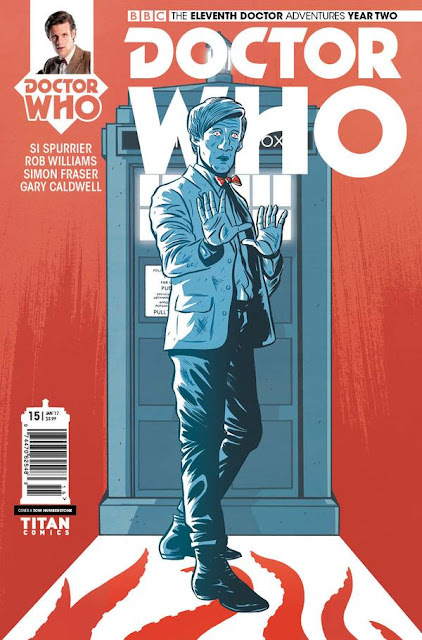 There’s possibly slightly less by way of staggering challenge to get on the page in this issue than there was in #2.14, but Fraser and Caldwell still make sure the emotional beats are right, the pace is delivered, the characters are as expressive as they need to be – there are some great ‘Cheesed-Off Eleventh Doctor’ images in here – and a continuing visual effect from the ‘mouthpiece of evil’ character is still disturbing as all-get-out, for all it’s used rather less here than in the previous issue. Again, perhaps best of all, they deliver the emotional upsurge of the ‘Everybody lives!’ solution in a way that gives you that satisfied sigh you give after a rich, large Christmas dinner, and they give you what you’ve been waiting for all year – a truly kill-crazy, exultant Dalek-Killer in full-throttle frenzy. 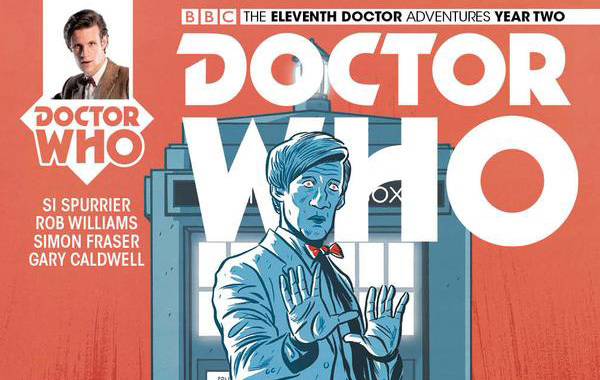 The Eleventh Doctor’s second year at Titan Comics has been a real ‘turned up to Eleven’ thrill ride, taking in more fan treats and offering more twisty-turny timey-wiminess than you could even wish for in an Eleventh Doctor Steven Moffat sweaty-browed dream. Spurrier and Williams have quite possibly at several points gone absolutely stark raving bonkers, and Fraser and Caldwell, we can only presume, have now retired to a dark room for a while to get things like the Malignant, The Then and The Now and the Volatix Cabal out of their system so they can be allowed to play with the Normal People again. This final issue hits all the points it needs to hit, and some of them, as you might expect in any story involving both River Song and Abslom Daak, it hits until they whimper and crawl away, begging for mercy. It’ll give you all the air-punching you demand of a series finale, while underlining the characters of everyone involved, including the Eleventh Doctor, that lonely old man with the boy’s face and the mind that thinks round not only corners but whole dimensions. It’s a glorious finish to a long, complex, roller-coaster year. Get it. Get it now, and prepare to go totally tonto.